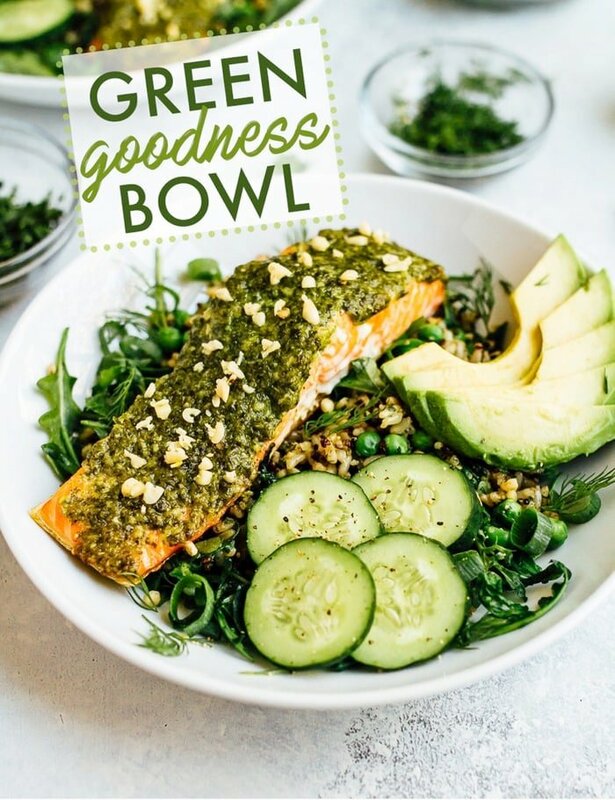 Loaded with hydrating greens, fresh herbs, healthy fats and high quality protein on a bed of wholesome grains, this green goodness bowl is your instant gateway back to balance and ease. This post is sponsored by Kroger. Have you ever come back from a weekend of indulging (oh hi summer wedding season) and just craved all the vegetables? 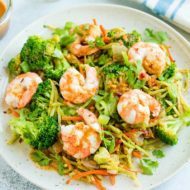 Perhaps a really simple source of protein to accompany the purity of the aforementioned veggie situation, and a healthy fat to soothe the inflammation in your gut? 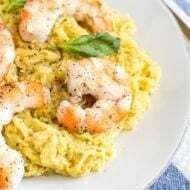 However, before you even make it to the grocery store you’ve excused yourself from the mere idea of having to prepare such a seemingly complex creation, because, after all, the weekend was exhausting enough. Well folks, rest assured that you’re not alone in this experience of reset and recovery. It’s our bodies natural way of re-balancing and finding homeostasis, and points to an efficient internal monitoring system. So though it may be beneficial to avoid sugar, alcohol, and refined carbohydrates for a few days that doesn’t mean our food has to be boring, bland, or labor intensive. Allow me to tempt you with this green goodness bowl. 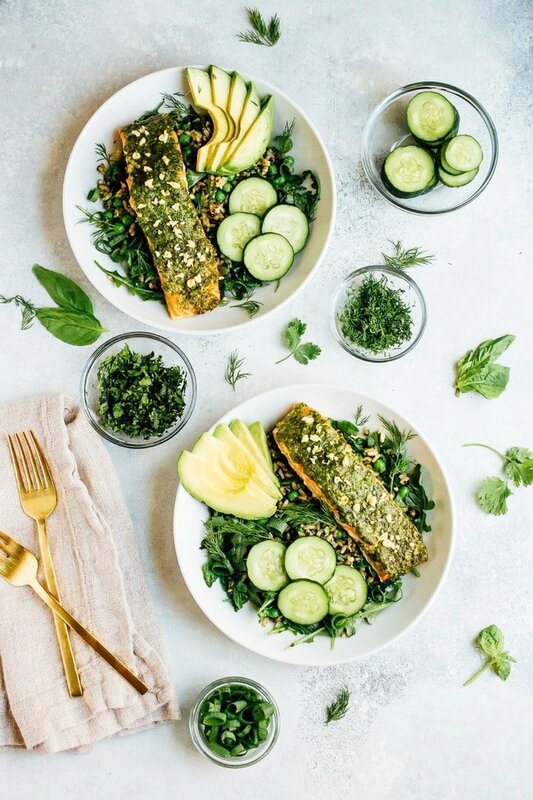 To combat digestive stagnation I used fresh fish (but any leaner cuts of protein would work), high fiber grains and greens, and added a number of ingredients to promote cooling + hydration within my core. I was also mindful to incorporate ingredients rich in antioxidants to support my body in it’s defense work against inflammation + bloat. This bowl is not only nourishing, but filling due to the combo of heart healthy fats and whole grains. Though fish can be intimidating to cook at first glance, knowing how to prepare and serve it is not only important for a balanced lifestyle but easier than you may think. This method is so simple, and takes no more than 15 minutes from start to finish. I thought I’d add some variety to my diet (and it looked better at the market) by opting for wild-caught Steelhead trout, which both resembles and tastes a lot like salmon. Trout is known to be rich in lean protein, vitamins, minerals and omega-3 fatty acids, while containing a low level of toxins like mercury and pesticides. However, you could use any lean piece of fresh fish to accompany your bowl. As I’ve discussed in previous posts, fats are an integral part of creating a satisfying meal that will keep you full for longer periods of time. Unsaturated fats, like those found in fish, nuts, seeds, olive oil, and avocado, shouldn’t be feared or avoided, as they’re a necessity for our bodies to carry out their normal functions. This doesn’t mean we can consume copious amounts of these foods, but it does mean we should incorporate them in our meals as healthier alternatives to saturated fats from animal products (dairy, bacon, pork, etc). That being said, I wanted my detox bowl to be loaded with unsaturated fats to help me reset + balance, as well as soothe any acute inflammation. 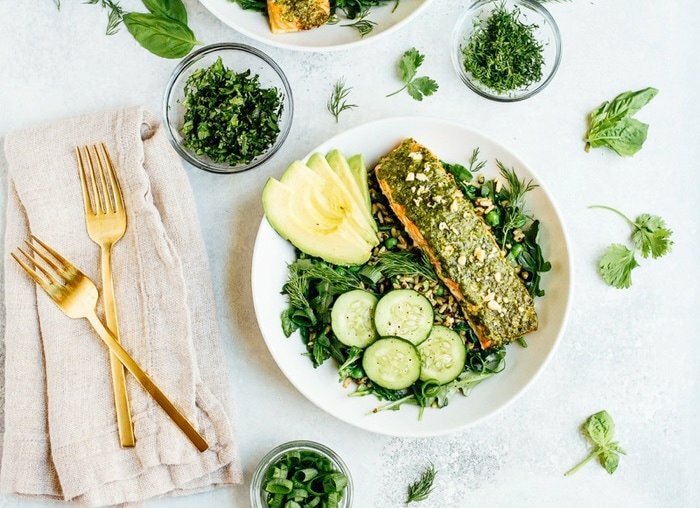 Adding pesto to the fish and grains not only gives the dish a powerful extra boost of flavor, but also introduces olive oil and pine nuts to the line up of hearty healthy fats. Topping the bowl off with avocado was like the cherry on my green goodness sundae. You know you’re an adult when you get so excited about your dinner that you equate it to a dessert! Next came all the greens I could find in arms reach: arugula, peas, green onions, and all the fresh herbs. Bitter flavors, like those found in arugula, are known to drain internal heat and soothe us during hot summer months. Did you know that green onions contain 100 times more phytonutrients than a regular onion? These are the compounds that give green onions both their anti-inflammatory and antioxidant qualities. Gimme, gimme! The time saving grace to this dish was the organic grain blend I had on hand from Seeds of Change, which allowed this bowl to come together in under 20 minutes. While the fish was baking, I chopped the herbs, and didn’t have to worry about fussing over two more pots on the stove. I heated the pre-cooked quinoa + brown rice a few minutes before the trout was done, and voila – dinner was ready and looked gorgeous! The blend would’ve been delicious by itself, but while it was sautéing on the burner I added peas, pesto, and arugula for an added punch… because let’s be honest, I can’t help but add my own flare. I purchased the Seeds of Change quinoa + brown rice blend from my local Kroger, which offers a wide variety of organic items at a great value. Kroger is the closest grocery store to our house and I love that they have such a large selection of organics. This month (from July 9 – July 26) Kroger is hosting a special sale on organic items with over $100 in digital coupon savings. Check out this link to see all the deals and get a coupon for the Seeds of Change product I used in this recipe. 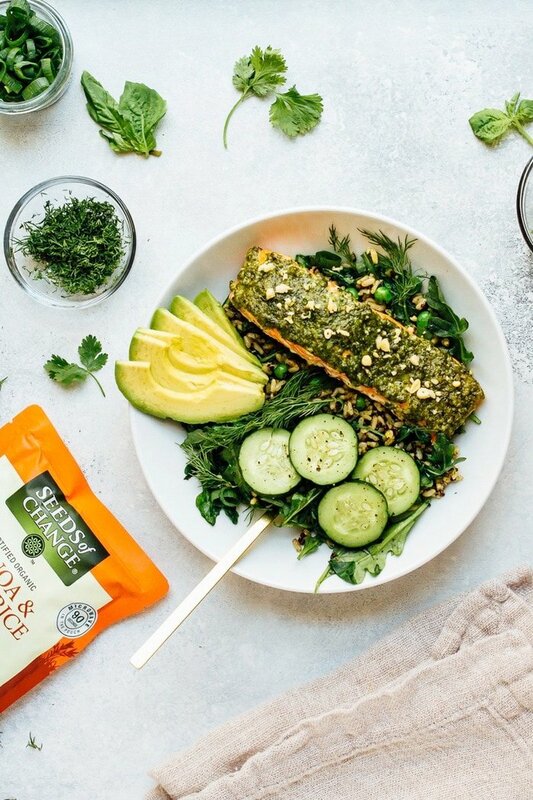 Loaded with hydrating greens, fresh herbs, healthy fats and high quality protein on a bed of wholesome grains, this green goodness bowl is your instant gateway back to balance and ease. Make pesto: add basil, garlic and pine nuts in a food processor. Process until finely minced. With the machine running slowly drizzle in the olive oil and process until the mixture is smooth. Add the cheese and process very briefly, just long enough to combine. Remove 3 teaspoons from food processor and set aside for later. Prep fish: add filets to a baking sheet and sprinkle with a little sea salt and fresh cracked pepper. Spread pesto sauce on top of each fillet. Bake prepared fillets in preheated oven for 12-15 minutes or until fish is cooked through and flakes easily with a fork. While fish is baking, prep grains and greens. Add 2 packages of Seeds of Change brown rice + quinoa blend to a large skillet with 3 teaspoons pesto and 1/4 cup water. Cook over medium heat for 2-3 minutes and then add fresh arugula, baby peas, dill and cilantro. Toss and heat until grain and peas are warm and arugula has wilted a bit. 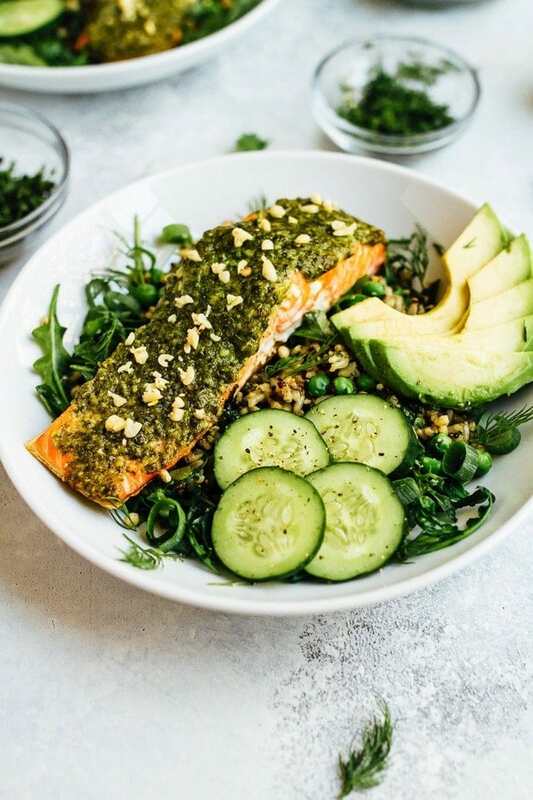 Prep 4 bowls: add a base of the grains and greens mixture to each bowl, top with cucumber, avocado and one fillet of baked fish. Add chopped pine nuts on top of each filet for garnish and sprinkle each bowl with spring onion, fresh dill, cilantro and cracked pepper. Serve immediately. This looks so, so delicious and refreshing! 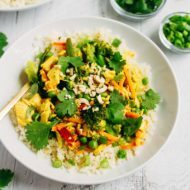 Such a good looking recipe!!! Definitely going to try it out minus the steelhead. I hope it was not a wild steelhead as they are on the verge of being listed under then Endangered Species Act. The bowl looks gorgeous! I love how green it is. I’ve been trying to eat healthier lately and your blog has been helping tons. Thank you so much!